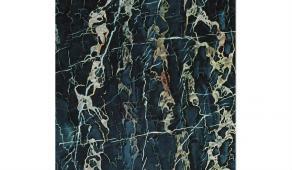 Marbling uses various materials and expert skill to produce patterns similar to marble or other stones. This centuries old faux decorative finish technique originated in Asia around the 957-995 CE and made it's way to Europe in the early 1700s. It has the amazing ability to make dull wood pillars transform into grand marble columns. Really, this technique combines the masterful techniques of fine art and marbling to enable exquisite patterns in any material. 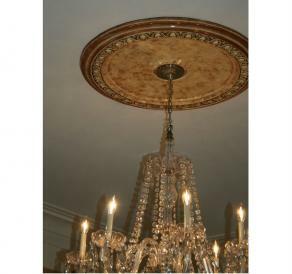 This plaster ceiling medallion received a faux marble treatment, giving the chandelier below it increased grandeur. The client requested that we apply this red faux tortoiseshell finish to the back of this built-in display case. 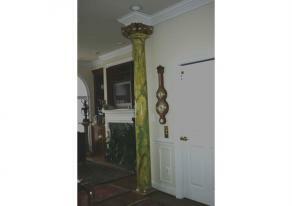 Green marbling applied to a decorative plaster interior column. An ordinary wood panel transformed into a dynamic green marble through the art of "marbling", with layers of paint. These samples of decorative faux marbling are furnished for the purposes of illustrating the range of styles and marbles that can be produced. Most samples are shown of paper or paperboard, but all can be produced on any paintable surface, including metal, wood, canvas or masonry.